Frances Leviston's first collection, Public Dream, was one of the most acclaimed debuts of recent years, and praised for combining 'technical mastery with a lucidity that verges on the hypnotic' (Independent). Leviston's keenly-anticipated second book sees both an intellectual and dramatic intensification of her project. We often credit poetry as a kind of truth-telling, but it can also be an agent and a vessel of disinformation: in the course of making its proofs and confessions, it also seeks to persuade and seduce by any means it can. Leviston uses both sides of poetry's tongue to address one of the key questions of the age: how have we come to know what we think we know? In the title poem, a woman preparing for a child's birthday party suddenly glimpses the invisible screen of false data behind which she lives - and her own complicity in its power. Many of these poems are concerned with ruined or abandoned structures, dismembered and disappearing bodies, constructed and deconstructed identities; behind them lie the false gods who manipulate the streams of information with which we must navigate the contemporary world. 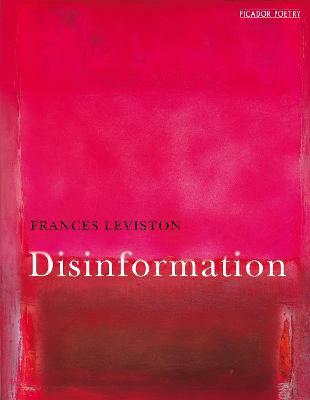 In Leviston's inimitably vivid and vital language,Disinformation challenges us to rescue our idea of identity from that mass of glib truth and persistent falsehood - and proposes how we might begin to think of poetry itself as a means to that end.